The government has given its approval for nearly three-quarters more councils to shift millions of pounds of school funding into their high-needs pot. Twenty-two local authorities have been allowed by the Department for Education to move more than 0.5 per cent from the schools block to the high-needs block this September, according to a written answer from Nick Gibb, the schools minister, this month. That’s 70 per cent more than the 13 local authorities that got permission to shift funding this year (2018-19). A total of 38 had applied to move money from next year (2019-20). South Gloucestershire got government approval to move 2.5 per cent, but in the end opted to move 1.9 per cent, or £2.9 million. READ MORE: Which local authorities got flexibility on high needs funding? Fifteen of the 22 councils provided us with full figures for how much they were transferring, which totalled over £35 million. 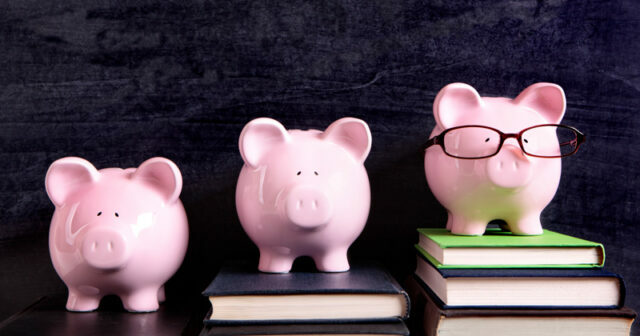 Julia Harnden, a funding specialist at the Association of School and College Leaders, warned that this left mainstream schools with less money to support pupils with lower levels of additional needs that didn’t qualify for top-up funding. The government decided last year that councils could only move up to 0.5 per cent from general schools funding to the high-needs block, which funds vulnerable pupils in specialist and mainstream settings, with the agreement of the local heads’ forum. 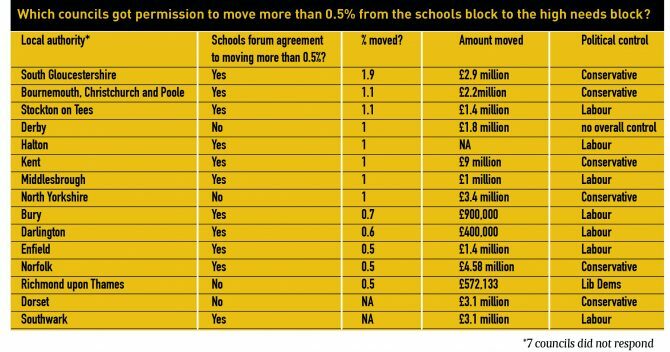 If councils wish to move more than 0.5 per cent, or want to move 0.5 per cent or less without agreement from their schools forum, they must get approval from the DfE. 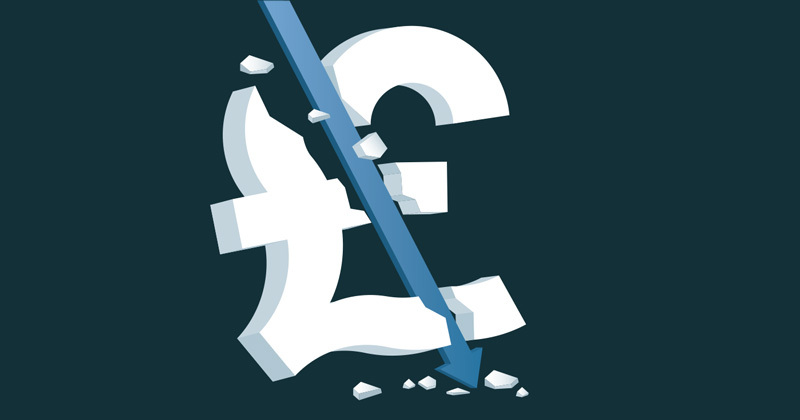 But the moving of money has left some school leaders feeling short-changed. Jim McAtear, the chair of Norfolk Academies, was expecting £320,000 for the trust’s four schools next year, before the council got approval to move £4.6 million out of the schools block. The trust will now struggle to improve one school graded “inadequate” in a deprived area, he said. However, a spokesperson for Norfolk county council said more pupils moving out of mainstream schools into specialist provision called for more cash to be transferred to the high-needs block. Other councils spoke of their regret at having to move the cash. A spokesperson for North Yorkshire council said it received £6 million less in central funding than it needed for high needs and warned that the system was “buckling”. Kent, which is moving £9 million, said the move was “something we would rather not do” but had been forced to do so owing to “the absence of adequate funding from the DfE”. Halton in Cheshire echoed that the government had failed to “fully fund” SEND provision, while Richmond-upon-Thames warned of “significant underfunding”. Middlesbrough said it had “no option” but to request the transfer, and Stockton said the lack of funding had “sadly” left it with a “difficult decision” to make. Five of the 22 councils got the go-ahead to move the cash in opposition to the wishes of their schools forum, Schools Week can also reveal. The DfE refused to name them, but council responses reveal four were Dorset, Derby, North Yorkshire and Richmond-upon-Thames. Nine councils also got separate approval to move up to 0.5 per cent without schools forum agreement. These were Dudley, Essex, Hackney, Hull, Oxfordshire, Sefton, Somerset, Staffordshire and Surrey. Stephen Tierney, the chair of Headteachers’ Roundtable, said schools were being put in an “awful” position by “voting for less core funding so vulnerable pupils weren’t too badly hit”. A DfE spokesperson said all schools block-movement requests were reviewed against clear criteria, which included the council’s “reasons for the request”, its strategic financial plan, and accompanying evidence from the local schools forum. It would be interesting to see if there was any correlation between those councils who have shifted cash to the High Needs budgets and the numbers of students within those councils who have been unable to get a place at mainstream because all local schools have claimed to be unable to meet their needs and have therefore needed out of area provision. Schools who pre-emptively exclude need to understand that those kids have to go somewhere and that shoving the responsibility back to the LA will have financial consequences for them. So easy to criticise schools for exclusion. So, so easy. Disruptive pupils can destroy the education of hundreds of other children, can attack them, can distribute drugs and that’s okay… Time to be honest here, schools do not exclude for fun, but for very good reason. Perhaps the idea of this comment is to distract readers from the reality of the destruction of poorer schools some local authorities and the Government have connived together in? OFSTED have said that there are clusters of schools who are off-rolling and that it only affects 10% of schools, so you are right in the majority of cases. That doesn’t mean that the minority doesn’t exist though and if it isn’t tackled then it’ll severely damage the reputation of the teaching profession. Maybe I have a nasty suspicious mind, I wouldn’t put it past some people to want to do that and to be looking for an opportunity to ‘reform’.